OK, sports fans: Who was the first openly gay male athlete to play in a professional sports league? Not Robbie Rogers. Not Jason Collins. And not Michael Sam. The answer is Andrew Goldstein. An All-American lacrosse goalie, he came out to his Dartmouth College teammates a full decade before those three better-known trailblazers. Goldstein was the first goalie to score in an NCAA tournament in nearly 30 years. The next year he played for the Long Island Lizards in Major League Lacrosse. You’re forgiven if you’ve never heard of it. Professional lax flies under the radar (and pays accordingly). So Goldstein soon moved on, and started a new life as a medical student. He continued to advocate for gay athletes, through speaking engagements, discussions with sports teams and through You Can Play. But gradually he left lacrosse behind. For the first time, he says, he was out as “a regular gay man.” Living outside of the sports world was an education. He needed the break. But he also needed lax. Eventually he joined a club team in his new hometown, Los Angeles. Goldstein had earned a bit of fame in 2005, when ESPN aired his story. After a surge of contacts from athletes – many of them closeted and struggling – the emails had slowed to a trickle. But last winter, the former college star – now Dr. Andrew Goldstein, a medical researcher at UCLA doing groundbreaking work on a possible cure for prostate cancer – received an email that changed not only his life, but a 12-year-old boy’s. Along with that youngster’s family, friends and now countless other strangers. Braeden Lange’s parents suspected he might be gay. When they asked the sixth grader, he told. His mother was proud of his self-knowledge and courage. His father came around fairly quickly. Braeden came out to some friends in a group chat. Some were supportive. But middle schoolers can be cruel. There was cyberbullying, and real-space taunting. Braeden withdrew. He cried himself to sleep. He talked about suicide. Braeden’s mother Mandy remembered seeing a story on a gay lacrosse player. She and her husband Scott found the ESPN piece. Immediately, they contacted Goldstein. He read their email at a propitious time. He’d just hear of the suicide of trans youth Leelah Alcorn. Goldstein vowed not to miss this opportunity to help a child in trouble. He did far more than seize a golden opportunity. Soon after contacting Braeden, he sent him that long-ago ESPN video. And his old Long Island Lizards helmet. Goldstein and his husband, Jamie Duneier, already planned to be in New York two weeks later. They quickly asked the Langes to join them. Incredibly, the day they met was Goldstein’s birthday. The family gave him souvenirs from Braeden’s tournaments. The youngster was shy – “like any 12-year-old would be,” Goldstein explains. Then the boy said, “Your helmet may not have meant a lot to you. But it meant so much to me.” He handed Goldstein a birthday card, with a note. He wrote that receiving the video was “the best day of my life.” Now he was “unstoppable.” He thanked Goldstein for being his role model, and his friend. The two lacrosse players headed off to Central Park, carrying their sticks. “We were just two athletes playing catch,” Goldstein says. But that was just a warmup. Goldstein wanted to do something else – perhaps a talk at Braeden’s school. Administrators nixed that idea (though Goldstein did end up talking about medicine to his science class). A better idea was to organize a lacrosse game – one that would send the message that being gay is fine. Over the next few frenetic weeks, Goldstein worked with Nick Wilson, a Seattle-area coach, to set up the show of support. Goldstein, Wilson and You Can Play co-founder Glenn Wittman called in favors. A former Dartmouth lacrosse coach offered to officiate. Braeden’s mom solicited donations from local businesses. Nike donated jerseys. On Memorial Day weekend – the day before the NCAA Division I championship match in Philadelphia, hundreds of lacrosse players and allies took part in The Courage Game. It was an incredible outpouring of support. Braeden’s friends and teammates were there. They saw him not as gay, but as a hero. ESPN featured the game on SportsCenter. Many viewers emailed Braeden directly. They called him a role model. Braeden Lange is still only 13. He just entered seventh grade. 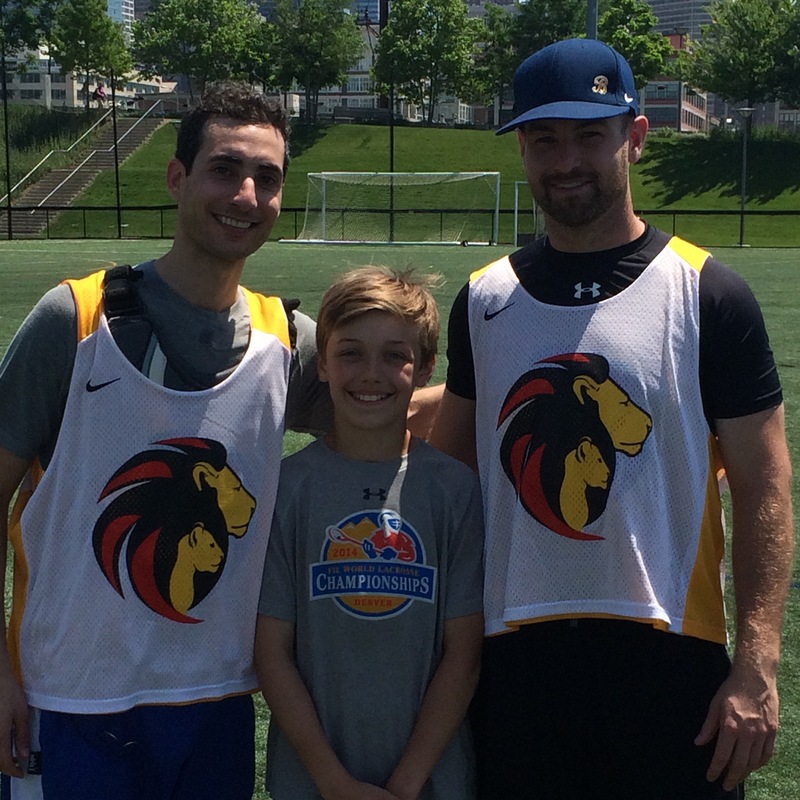 But – like his own role model, Andrew Goldstein – this lacrosse player is already paying it forward.